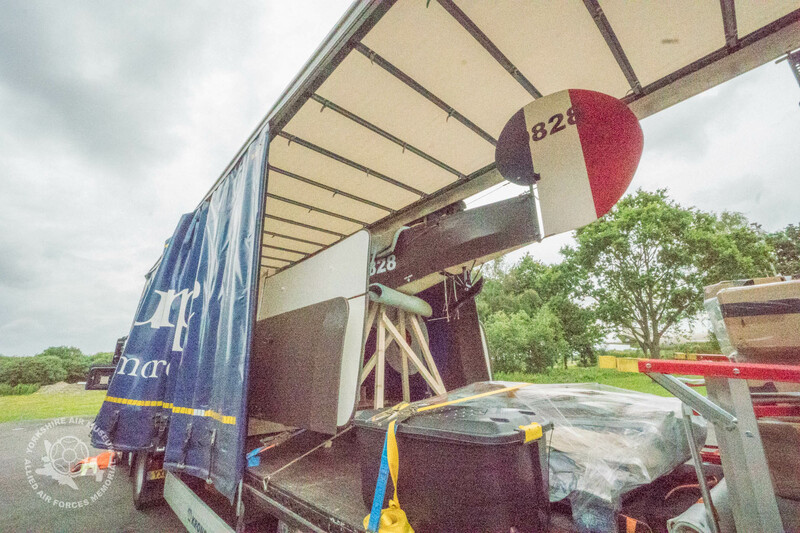 How we took our AVRO 504 aircraft to the Thiepval Commemorations and displayed her before 10,000 invited guests. “How on earth did you get it here?” was quite possibly the most frequently asked question of our engineering team as we chatted to the large crowd at the majestic Thiepval memorial in Picardy on the 1st of July 2016. The occasion was to commemorate the 100th anniversary of the commencement of the Battle of the Somme. A day that, exactly 100 years previously, began at 7:30 am with troops advancing towards the German lines into a murderous hail of fire and ending that evening with 19,240 soldiers dead. To be asked to be present on this occasion was a very significant invitation, so to answer the question of ‘How?’ here are some more details of the work that went into making everything happen. The process began with a contact by Museum Director, Ian Reed with the Department for Culture, Media and Sport around the possibility of the Museum’s AVRO 504 being present to represent the Royal Flying Corps and the Royal Naval Air Service, the two fledgling air services of the time. With more than 10,000 people due to arrive for the ceremony which was to be screened live across the world, it was felt that early military aviation should be represented and on view to those guests. Our Aircraft Engineering team have previous form for accomplishing such tasks, having managed to position our Hurricane on top of the York Theatre Royal in 2014 and even squeezing our Eastchurch Kitten inside of the Royal Aeronautical Society headquarters in Central London in 2015. So it was possible, but it would be tight. The wing structure was in good shape, but they had to be removed individually and the rigging wires removed. This meant that each of the four wings had to be refitted individually then the whole thing re-rigged and tensioned on location at Thiepval. Further tests showed that it was possible, but we certainly would hope for a light wind to rebuild her in the open air in France…. Further surveying showed that the cockpit sections needed some work. The aircraft had originally been re-created by the RAF so that she would be viewed from a distance. So while the build was very accurate, incorporating original components, the cockpit would need some further attention if she was to be scrutinised at close quarters. Grant Sparks, Brian Whatmough and our French engineering students with us on summer placement, all took a hand in creating a fresh cockpit interior, while some skilled joinery work by Gary Hancock steam-formed some replacement wooden mouldings. Finally, her existing green paintwork was the subject of some discussion, as research by volunteer Graham Sharpe showed that AVRO 504’s of that period were actually brown with black engine cowls. Graham also researched an accurate aircraft registration which was in use during the Battle of the Somme period. Fresh from his work on the great repaint of the Museum’s Tornado, Andre Tempest got to work on applying the new colours to the vintage fabric, giving the AVRO a totally fresh appearance. This process of research and restoration and renovation was carried out over a period of just six weeks, with a final test assembly taking place just 48 hours before she was due for departure to Thiepval in France. Museum Technician Gary Hancock created some custom jigs to hold the delicate wing assemblies in an upright position to enable them to be transported securely by road. As a global event to be attended by world dignitaries including heads of state and members of the Royal Family, there were complex security procedures to negotiate. Additionally, everyone had to be fed and housed for the duration whilst satisfying the usual safety protocols. Museum Operations Manager Lisa Rawcliffe undertook a comprehensive and wide ranging risk assessments both for our own use and for anyone on location to prove that we had, hopefully, thought of everything! That just left a vehicle to transport it. Middlegate Transport NV were absolutely superb both in the UK and in Europe. With offices both in the UK and Belgium, they supplied a curtain-side HGV unit giving us easy fork-lift access to load the fuselage and wings at Elvington. Once across the North Sea (with special thanks to P&O Ferries for their support) a second tractor unit, complete with special personalised registration number to mark the occasion, was waiting for us in Belgium, to continue the journey south to France and Thiepval. Their experience in organising the transport logistics in such a seamless way with our engineers made the whole exercise of transportation totally painless and we are very grateful for their professional expertise and personable staff who were a pleasure to work with. Thank you for the great personal registration number! 48 hours later the team arrived in Thiepval to join in with the huge logistical operation taking place running up to the event. Unloading and assembly of the aircraft was a task of around four hours, the only issue being the nerves of the local fork lift truck driver who took one look at the AVRO and decided to step aside and give the keys to Brian Whatmough, who remained untroubled with the minor issue of precisely unloading the AVRO in an unfamiliar fork lift truck…. The day of the event involved a 3:30 am start to allow for the massive security logistics to access the area. Anyone who watched the ceremony live on global television will be aware that it was a very poignant and emotional event, with readings and contributions by national leaders and also representatives of all the armed forces from the time, including a poignant reading by a soldier of the German Army. The reception from the guests at Thiepval was tremendous. Graham Sharpe and Gary Hancock both donned their period clothing and were much in demand for photographs as everyone waited to be seated at the Memorial. The ceremony was quite emotional, with quite a few soldiers from various nations rubbing a little grit from their eyes at various moments as they stood on the sidelines watching. To be present at such a significant event representing both the Museum/Memorial and the airmen who fought in these battles was something that everyone concerned was very proud of. No person with even an a ounce of humanity could fail to be moved by a location like Thiepval and it is fair to say that each of us found the occasion very thought provoking, within the backdrop of the turbulent world in which we live in today. After all the visitors had left, all that remained was to reverse the entire process, at sunrise the following morning, for the journey back across the North Sea. A homeward journey that, 100 years ago, many thousands of young men were never able to make. Planning, logistics and safety by Ian Reed, Barbara George and Lisa Rawcliffe. Plus of course, everyone else at the Museum who stepped forward with offers of help and encouragement. If we’ve missed a name, it’s simply because there were so many involved.